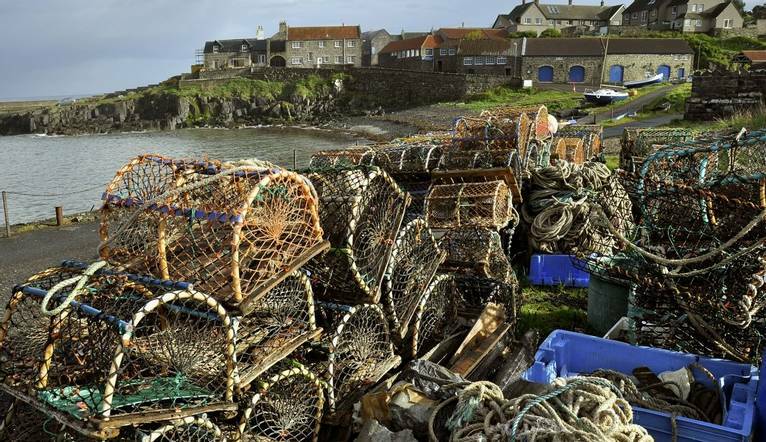 This first full day walk starts and finishes in the small fishing village of Craster, famous for its kipper, and takes in the stark ruins of Dunstanburgh Castle. In an area particularly rich in castles it remains, nevertheless, one of the most attractive, standing out majestically against the backdrop of the North Sea. We will walk along fine close-cropped grassy paths, with the sea for company, pass two important seabird colonies, a shipwreck and the entrance to Howick Hall Gardens (the home of Earl Grey tea). We walk through farmland seeing the remnants of an unusual World War II pillbox before stopping off at the delightful Cottage Inn for lunch (own account). Sundays walk follows the coast from Boulmer (tide permitting) down the coast to Almouth, an attractive little seaside town, all red roofs and colour-washed walls. Following the River Aln, we walk around the estuary which is significant in size at high tide and is a haven for wildlife and birds. Continuing through meadows and along the Buston Links dunes, a National Trust managed site which is haven for wildflowers and is protected for its sea rocket, the path leads into Warkworth. After a pub lunch (own account) we visit this delightful village with its imposing C15th castle, once the home to the mighty Percy barons. We walk along the peaceful River Coquet skirting the castle grounds and back into the village. I enjoyed the company of the other guests on the holiday. The hotel and food was good, and the two nice walks were organised well with the walk leader. Well organised and worked well for a short break. Nice hotel, good walks, sociable in the evenings - I really enjoyed it! The hotel is located off the A1 with Newcastle Central Station 5 miles away. Complimentary car parking is available. Found in 12 acres of stately parkland just a few minutes from Newcastle Racecourse, this stylish hotel offers a welcoming bar and lounge and international restaurant. We can relax in the spa with a treatment (extra charges) or enjoy the indoor swimming pool, gym and sauna. Our contemporary rooms are air-conditioned and feature ironing facilities, safe, satellite TV, tea/coffee-making facilities, hair dryer and Wi-Fi (chargeable). Two guided walks are included in the programme. The walking programme is graded easy to medium and you can expect to walk up to 11km (8 miles) on the first walk and around 16km (10 miles) on the second walk. A coach will be used to transfer you to the beginning and end points of both walks. There is often confusion on the question of gratuities, since it frequently depends on the type of holiday, location and, of course, your attitude towards tipping, as to what is normally expected. In order to give you a rough idea, we have given appropriate guidance below. The Tour Leader will be on hand to offer advice or suggestions if required but gratuities are offered entirely at the sole discretion of the individual. We suggest a group collection at the beginning of your holiday to cover drivers, guides, porters and hotel staff (including restaurant, kitchen and reception staff) of approximately £10. Your Tour Leader will collect this on your behalf and distribute it accordingly, thus relieving you of the burden of who, when and how much to tip. The tipping of bar staff and housekeeping will be left to your individual discretion (the rounding up of the drinks bill and a small amount left in your room on departure should cover this and would be much appreciated). For any meals that are not included in your itinerary, restaurants expect a 10% gratuity (do check that service has not already been added to your bill). For taxis 10% of the metered fare.